Astronomers using the Hubble Space Telescope have pieced together this picture that shows a small section of space in the southern-hemisphere constellation Fornax. 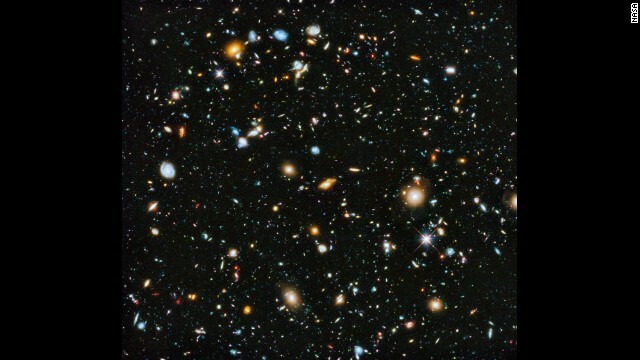 Within this deep-space image are 10,000 galaxies, going back in time as far as a few hundred million years after the Big Bang. Click through to see other wonders of the universe. Planetary nebula Abell 33 appears ring-like in this image, taken using the European Southern Observatory's Very Large Telescope. 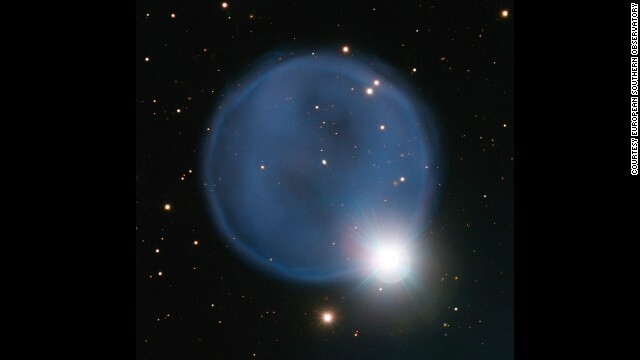 The blue bubble was created when an aging star shed its outer layers and a star in the foreground happened to align with it to create a "diamond engagement ring" effect. 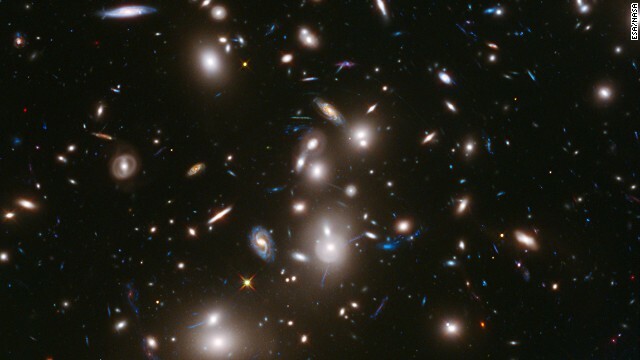 This long-exposure image from the Hubble Telescope is the deepest-ever picture taken of a cluster of galaxies. The cluster, called Abell 2744, contains several hundred galaxies as they looked 3.5 billion years ago; the more distant galaxies appear as they did more than 12 billion years ago, not long after the Big Bang. NASA's NuSTAR telescope array generated the first map of radioactivity in the remnants of an exploding star, or supernova. Blue in this image of Cassiopeia A represents radioactive material. 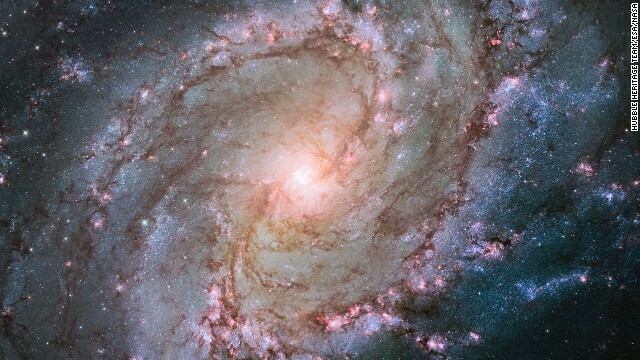 A supernova was spotted on January 21 in Messier 82, one of the nearest big galaxies. This wide view image was taken on January 22. The M82 supernova, seen here, has been designated SN2014J because it is the 10th supernova detected in 2014. At 11.4 million light years from Earth, it is the closest Type Ia supernova recorded since systematic studies with telescopes began in the 1930s. Is that a giant hand waving at us? Actually, it's what's left of a star that died and exploded a long time ago. 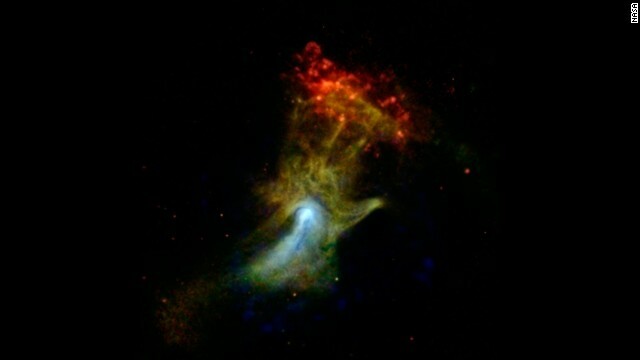 Astronomers nicknamed it the "Hand of God." NASA's Nuclear Spectroscopic Telescope Array, or NuSTAR, took this image in high-energy X-rays, shown in blue. The image was combined with images from another space telescope, the Chandra X-ray Observatory. The Hubble Space Telescope captured this image of the Southern Pinwheel Galaxy, one of the largest and closest galaxies of its kind. The center of the galaxy is mysterious, researchers say, because it has a double nucleus -- a supermassive black hole that may be ringed by a lopsided disc of stars, giving it the appearance of a dual core. 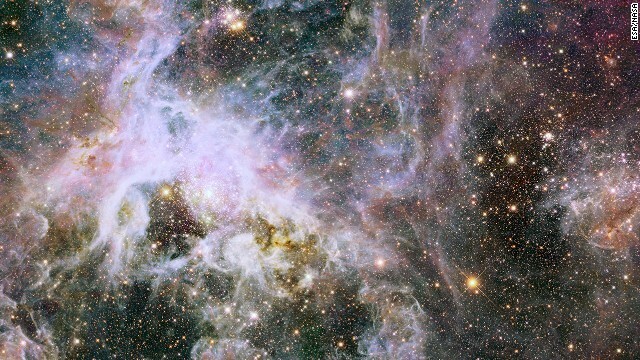 Hubble scientists say this is the best-ever view of the Tarantula Nebula, which is located in one of our closest galactic neighbors, the Large Magellanic Cloud. 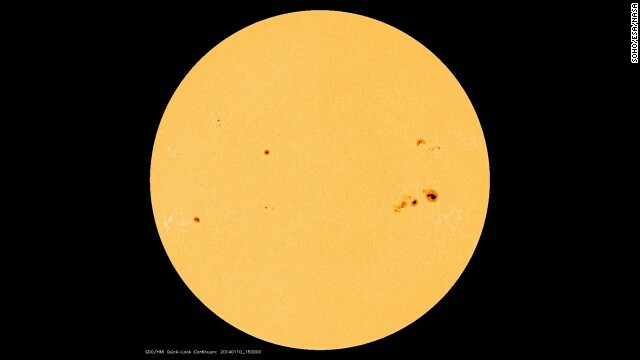 Those spots on our sun appear small, but even a moderate-sized spot is about as big as Earth. They occur when strong magnetic fields poke through the sun's surface and let the area cool in comparison to the surrounding area. This Hubble image looks a floating marble or a maybe a giant, disembodied eye. But it's actually a nebula with a giant star at its center. Scientists think the star used to be 20 times more massive than our sun, but it's dying and is destined to go supernova. CNN Labs explores the latest innovations around the world to showcase cutting-edge designs and groundbreaking research in science and technology. 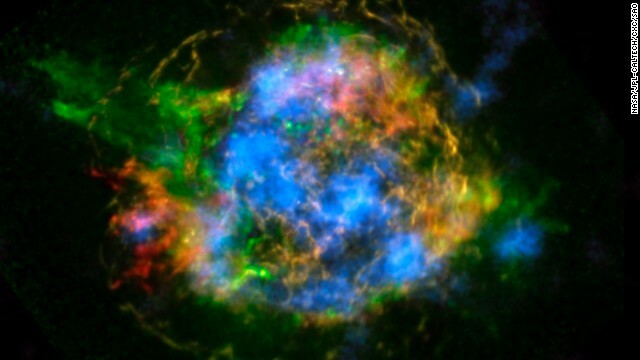 (CNN) -- Cassiopeia A was a star more than eight times the mass of our sun before it exploded in the cataclysmic, fiery death astronomers call a supernova. "Until we had NuSTAR, we couldn't see down to the core of the explosion," Brian Grefenstette, lead author and research scientist at the California Institute of Technology, said at a news conference Wednesday. NuSTAR's observations of Cassiopeia A showed scientists the location and distribution of radioactive titanium-44, an unstable isotope with a half-life of about 60 years. The supernova explosion's light arrived on Earth about 350 years ago, but even today there's still plenty of titanium-44 to be observed. There's currently no solid model for how the supernova explosion process actually works, Grefenstette said. Scientists would like to know more, especially because the components of our planet came from a supernova that blew up about 5 billion years ago. "People should care about supernova explosions because that's where all the stuff that makes us comes from," Grefenstette told CNN. "All of the iron in your blood and calcium in your bones and teeth, and gold in your wedding band, that all comes from the center of a supernova explosion." When stars collide ... we get gold? The map of the radioactive ash that NuSTAR studied is akin to a "fossil record," Grefenstette said. 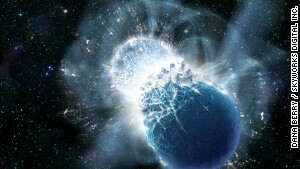 It is an imprint of what happened in the explosion, and it is helping astronomers rule out previous ideas about how stars explode. So here's what scientists think is happening: At the center of the supernova, an intense amount of pressure builds up. Neutrinos, tiny particles, are produced and heat up the gas in the center. "What you get is just like when you're boiling water on your stove top: You get hot bubbles at the bottom that try to rise up through the cold material above it, and the whole thing starts to slosh around," Grefenstette said. Big "bubbles" form in this process, and the whole thing starts to fall apart, he said. "It's like blowing the top off a pressure cooker, and the shock wave rips apart the star," Grefenstette said at the news conference. "It's like you blink your eyes twice, and the whole thing has exploded, and we're seeing it three or four hundred years later, preserved in the radioactive ash," Grefenstette said. Researchers describe this explosion process as "asymmetrical" because according to their modeling, temperatures and densities must be different around the explosion in order for the "bubbles" to escape and let the shock wave out. Scientists aren't ready to say definitively that this "sloshing" model of supernova explosion caused Cassiopeia A to blow apart, but the evidence supports that theory, Grefenstette said. It's unlikely that any Earthlings observed it back in the 17th century, however, because of the amount of dust between our planet and the supernova explosion. 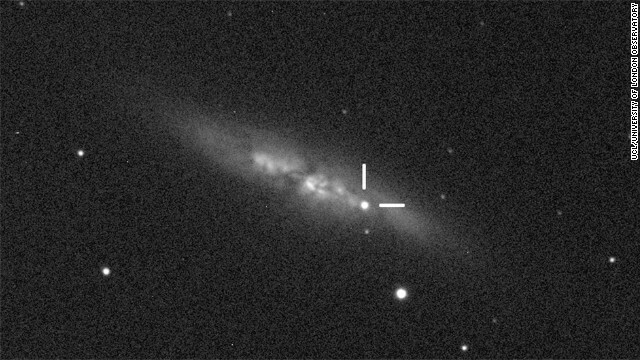 There is a record of a new star charted by a British astronomer around the time the supernova's light should have reached us, but it's controversial, because that star is not in the place in the sky where Cassiopeia A would have been. The Hubble Space Telescope has examined the supernova's optical light, and the Chandra X-ray Observatory looked at its low-energy X-rays. The radioactive ash is available for the first time to NuSTAR, which can detect high-energy X-rays. This may mean that that there is more iron that hasn't been seen yet or that there is something completely different that generates elements. "NuSTAR is living up to its name way in two ways," Robert Kirshner, an astronomer at the Harvard-Smithsonian Center for Astrophysics who was not involved in the study, said at the news conference. "It's not just nuclear, but it's new." 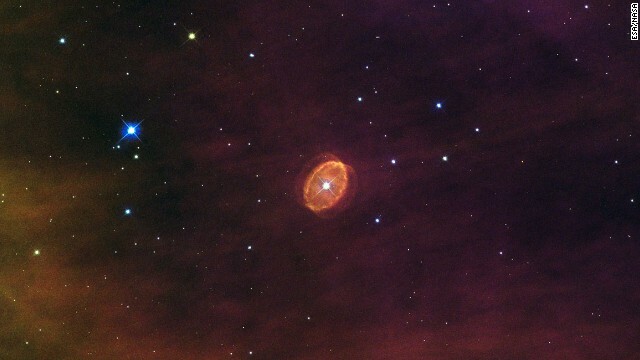 Cosmic wow, a rare exploding star! Biometric technology is being used to create guns that identify a user from their fingerprints and from their grip. As the World Wide Web turns 25, its creator talks about spying, censorship and freedom. This incredible map reveals the sprawling network of the underwater Internet. Cassiopeia A was a star more than eight times the mass of our sun before it exploded in the cataclysmic, fiery death astronomers call a supernova. U.S. scientists say they've produced more energy from a fusion reaction in their fuel source than they put into the fuel, a research milestone. Robots that behave like termites could be useful for construction projects that would be too dangerous for humans. Researchers used DNA to track historical mixings of populations during more than 4,000 years in a new study. A lively community of startups, hobbyists and photographers have embraced DIY drone technology. In recent years we've discovered some of the strangest things on the Red Planet like ice spiders and spiral-shaped lava tubes. It is an age-old question: will humankind ever defeat old age?